Page revised in October 2015. 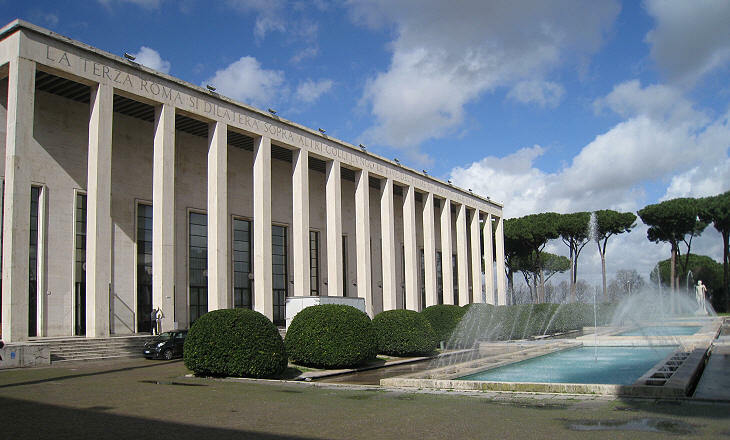 In 1936 the Italian government made a successful application for hosting in Rome the next World Exhibition which was due in 1941. The Exhibition was soon postponed to 1942 to celebrate the XXth anniversary of the Fascist regime. The area chosen for the exhibition was some three miles south of the walls, near the river and the road to Ostia. The architect Marcello Piacentini was asked to coordinate the development of a plan having the objective to create a new quarter of Rome and not only to build the temporary pavilions required by the Exhibition. Marcello Piacentini was renowned for the neat design of the new Railway Station of Florence, but the government wanted to emphasize the monumental aspects of the new quarter and Piacentini and the other architects who cooperated with him had to meet this expectation. In some minor aspects however (e.g. in the mosaic shown above), artists managed to refrain from the recommended form of art. The new quarter was soon known as E.U.R., the acronym of Esposizione Universale Roma. 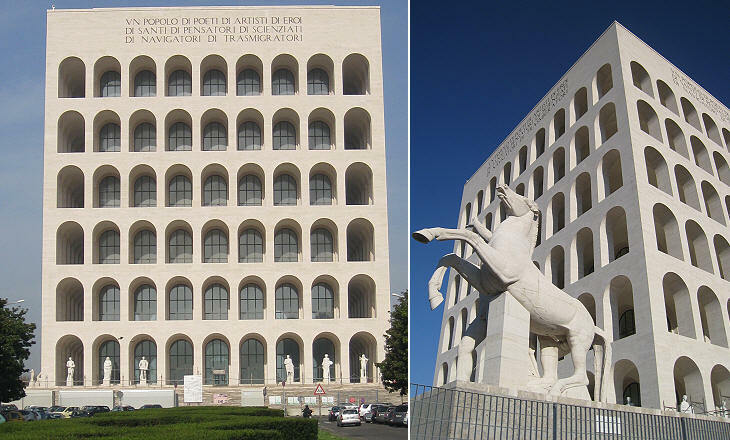 The Fascist regime emphasized the links between the expansion of the Roman Empire and its own aggressive policies and it poured money into redesigning in a spectacular way many areas of the city, mainly to the detriment of medieval or Baroque monuments; surely the regime had something in common with the ancient Romans: a passion for erecting large buildings. 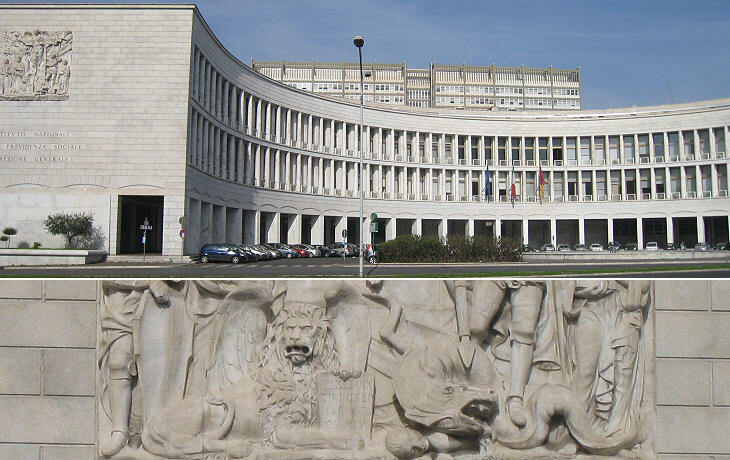 Nevertheless the inscription on Palazzo della Civiltà Italiana (renamed della Civiltà del Lavoro) does not include costruttori (builders) in the list of the attibutes of the Italians. DI NAVIGATORI DI TRASMIGRATORI (the meaning of this word today is rather obscure, but in the 1930s it was a reference to the first intercontinental flights). The inscription as well as the building were the subject of many jokes: less commendable attributes were added to the list and the building was soon called Colosseo Quadrato (square) and even worse Palazzo del Groviera, after the Swiss cheese gruyère. While the arches of the building are a reminder of the Colosseo arches, the four statues at its corners have many points in common with those in Piazza del Quirinale. 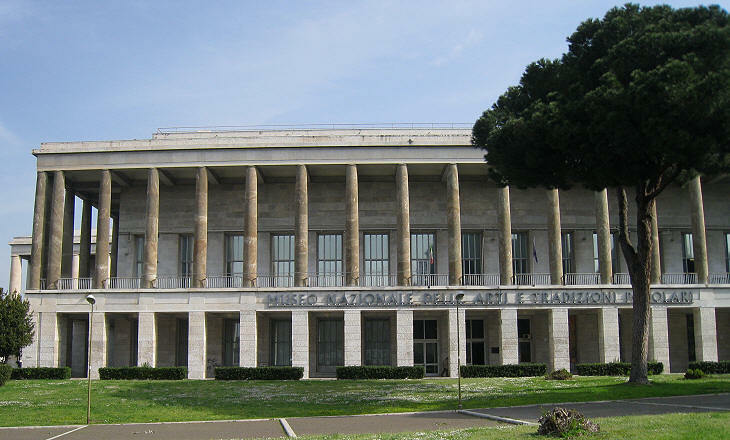 The first building to be completed was aimed at housing the offices for the Exhibition, and it included a large hall announced from the outside by a high portico (on its top an inscription celebrates the expansion of Rome towards the sea). 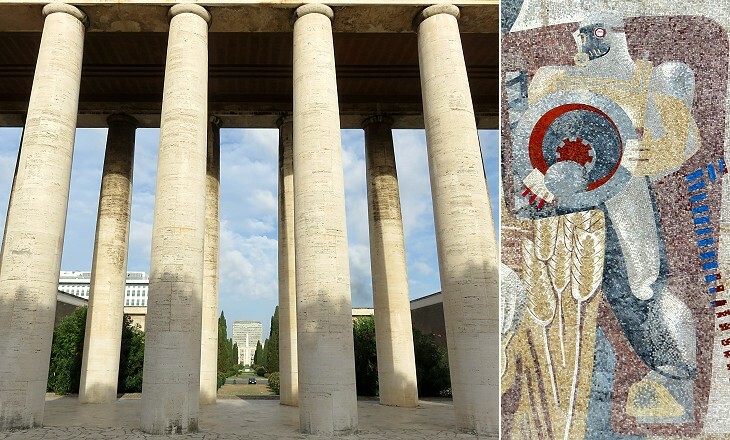 While the building had a very neat and modern design the mosaics and the reliefs which embellished it were evocative of Ancient Rome. 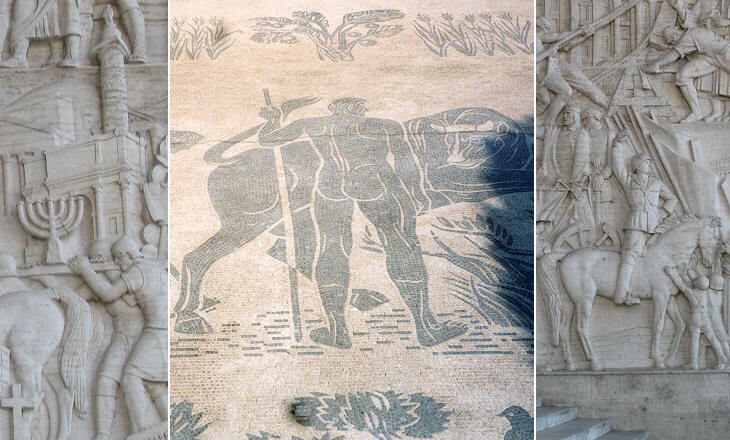 The black and white mosaics replicated a pattern typical of Caracalla's Baths and the reliefs portrayed ancient monuments (in the image above: the Arch of Titus, Trajan's Column and the Pantheon). Mussolini himself was portrayed as if he were a direct descendant of the Roman consuls and emperors. He had a peculiar way of speaking with his fists pointed against his hips as shown by the position of his left arm; the right arm is raised in the so called saluto fascista which had replaced the traditional shaking of hands. What at the time must have looked very impressive, today appears a flattering description of Mussolini's ability to ride a horse without holding the reins. Michelangelo Antonioni is an Italian filmmaker who became famous in the early 1960s by a series of movies which depicted the difficulty of living, not because of material conditions or negative events, but because of existential anxieties. He shot several scenes of The Eclipse (1962) among the EUR buildings. The empty porches, the isolated statues, the unusually shaped buildings provided him with a not humanly scaled background which highlighted the feeling his characters had of living in an alien world. The Exhibition never took place because of WWII and the few buildings which had been completed were occupied by families who had lost their homes because of war events. 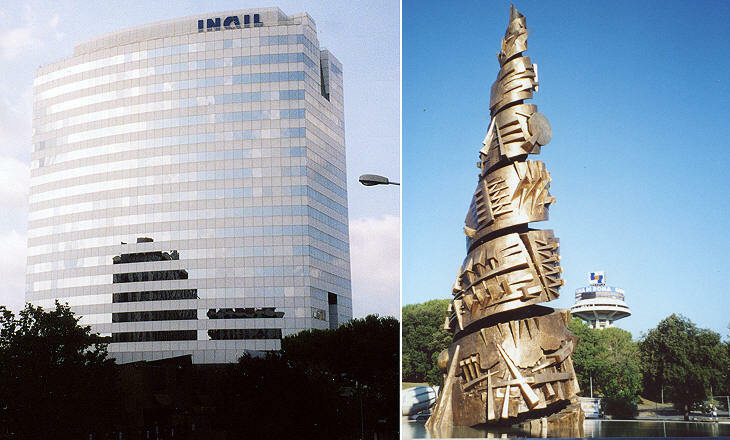 In 1951, when the post war emergency was gradually receding, the Italian government decided to complete the quarter by relocating public offices and by inviting companies to build their headquarters in the new quarter. The quarter was renamed Quartiere Europa retaining to some extent its original name and the streets and buildings were in some cases renamed too in order to cancel references to the past regime. 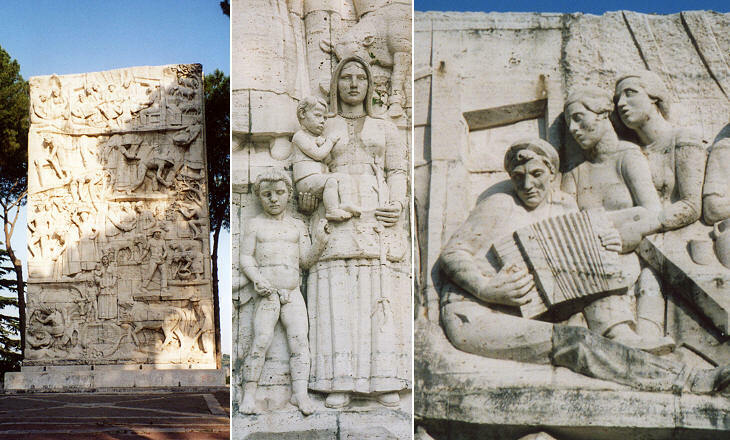 The assignment to Rome of the 1960 Olympic Games gave a new impulse to the completion of the monumental parts of EUR. 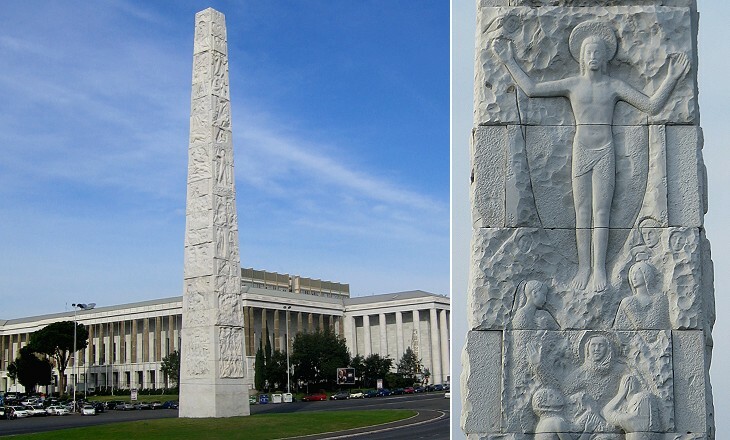 The gigantic stela dedicated to Guglielmo Marconi was meant to represent a radio transmitter, but it is usually regarded as a modern obelisk of Rome, but it does not have the grace of the originals. Its construction was interrupted because of the war when the sculptor had completed only the two lowest rows of reliefs. 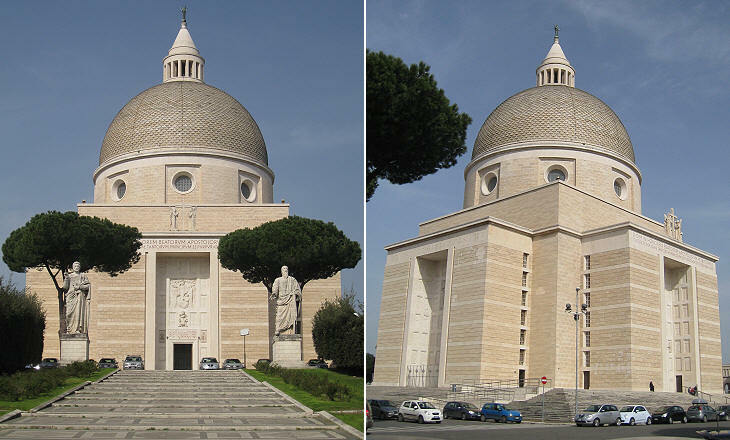 The decision to complete the monument was accompanied by that to ensure that its decoration was consistent with the new Italian political environment which was heavily influenced by the actions of Pope Pius XII. This explains the otherwise unexplainable presence of reliefs having a strongly religious connotation in a monument dedicated to a scientist. The EUR houses several museums which are scarcely ever visited by tourists. One of them (Museo Nazionale Preistorico Etnografico) includes most of the collection of African, Chinese and American handicrafts gathered in Collegio Romano by the Jesuit Athanasius Kircher in the XVIIth century. Another interesting museum (Museo della Civiltà Romana) includes a reconstruction (scale 1:250) of the City of Rome in the IVth century. 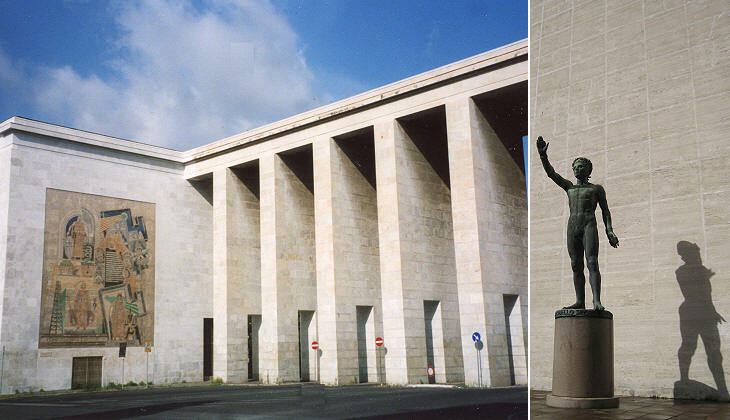 Also the materials used in the EUR buildings remind visitors of Ancient Rome: for the columns of the building shown in the picture the architects used a green stone resembling cipollino, a marble very much in fashion in the IInd century (see the cipollino columns of the Temple of Annia Faustina - S. Lorenzo in Miranda). 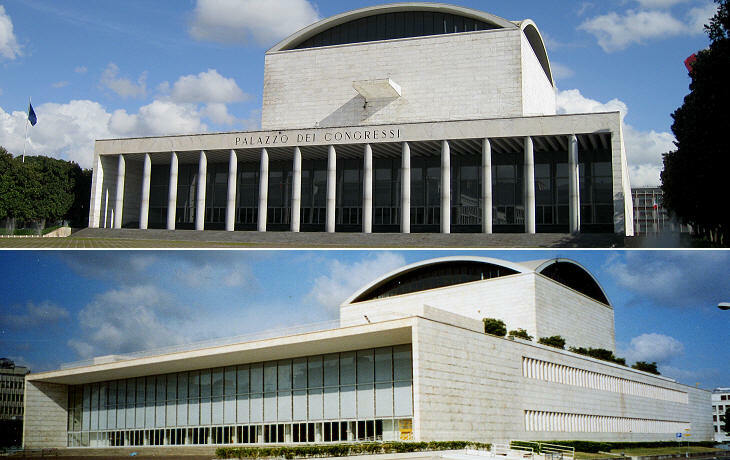 The low dome of Palazzo dei Congressi is evocative of the Pantheon and the reference is more evident when the building is seen from the front (as in the image used as a background for this page). The photo of the rear view was taken on a summer Sunday when this part of EUR is almost deserted (if you wish to see the monuments of Rome on a summer Sunday morning click here). This palace is decorated with vaguely Renaissance reliefs portraying allegories of the Italian Maritime Republics (the winged lion of Venice and St. George, protector of a Genoese maritime company). Its design can be associated to that of the Trajan's Markets.. The church of EUR clearly descends from Michelangelo's plan for St. Peter's which was based on a Greek cross shape. 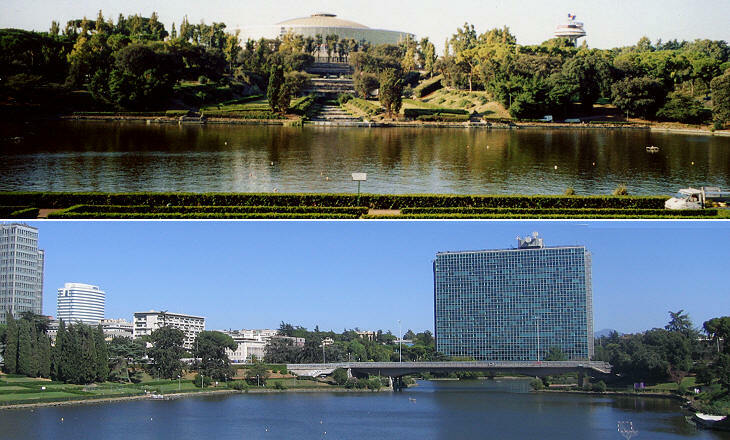 EUR played a great role in the 1960 Olympic Games EUR: short rowing contests took place in a pond embellished by gardens and dominated by a circular building for matches of basketball and other sports. In this large 1960 relief the sculptor wanted to portray the simple life of rural Italy: he did not realize that in those years that idyllic world was rapidly disappearing: a booming economy, the impact of television and motorization, a falling birth rate had changed Italy. In the city of Rome and its immediate suburbs buildings cannot exceed a certain height so that they do not normally exceed ten storeys. This limit is lifted for the EUR quarter which does not impact on the traditional view of Rome. The most recent addition to EUR is a 2004 work by Arnaldo Pomodoro, a sculptor known for his spheres (one of them is in Cortile della Pigna and another one at modern La Farnesina).